Three men have been found guilty of murdering a Cambridgeshire teenager in what the judge called a "racist killing". 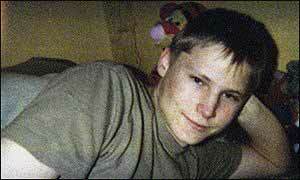 Ross Parker, 17, of Bozeat Way, Peterborough, was stabbed to death with a foot-long hunting knife early on 21 September 2001. Shaied Nazir, 22, Ahmed Ali Awan, 22, and 25-year-old Sarfraz Ali, all of Peterborough, had denied murdering Mr Parker. Jurors at Northampton Crown Court later cleared a fourth man, Zairaff Mahrad, 21, of murder and manslaughter. The jury had been told how Mr Parker, of Bozeat Way, Peterborough, was walking home in the early morning with his girlfriend when he was attacked by a gang of men. They sprayed an aerosol in his eyes before punching, kicking and hitting him with a hammer and then stabbing him in the throat with the knife. Sentencing the three guilty men, judge Sir Edwin Jowitt QC said: "A racist killing must be one of the gravest kinds of killings." He described Ali Awan as the "prime mover", saying: "It was you who had the knife and it was you who used it." But he told the other two they had known of the knife and both knew "the strong likelihood" that the victim would be killed. Sentencing all three men to life in jail, he recommended that Ali Awan serve at least 18 years before being considered for parole, and Nazir and Ali at least 16 years. Angry scenes erupted in the courtroom when the first three verdicts were announced. The family of Nazir wept and shouted and his brother, Wyed, who earlier gave evidence for the prosecution, screamed: "My brother is not a murderer." He had to be restrained by police and security staff while the jury left the courtroom to continue its deliberations in relation to Mr Mahrad.